Factory Window Sticker Price $53185.00I bought this truck brand new you will not get a better buy!!! !Loaded with options here is just a few Wheels: 20 x 8 Aluminum Chrome Clad, Vinyl Door Trim Insert, Variable Intermittent Wipers, Valet Function, Urethane Gear Shift Knob, Trip Computer, Transmission: 8-Speed Automatic (8HP70), Transmission w/Driver Selectable Mode and Oil Cooler, Towing w/Harness and Trailer Sway Control, Tires: P275/60R20 BSW AS. This Ram 1500 has a dependable Intercooled Turbo Diesel V-6 3.0 L/182 engine powering this Automatic transmission. *These Packages Will Make Your Ram 1500 Big Horn The Envy of Your Friends *Tire Specific Low Tire Pressure Warning, Tip Start, Tailgate/Rear Door Lock Included w/Power Door Locks, Tailgate Rear Cargo Access, Systems Monitor, Streaming Audio, Storage Tray, Spare Tire Stored Underbody w/Crankdown, Single Stainless Steel Exhaust, Side Impact Beams, Short And Long Arm Front Suspension w/Coil Springs, Sentry Key Engine Immobilizer, Seats w/Cloth Back Material, Remote USB Port, Remote Keyless Entry w/Integrated Key Transmitter, Illuminated Entry and Panic Button, Regular Box Style, Redundant Digital Speedometer, Rear Cupholder, Rear Child Safety Locks, Radio: Uconnect 3C w/8.4 Display -inc: Nav-Capable! See Dealer for Details, 6 Month Trial (Registration Required), Uconnect Access, 8.4 Touchscreen Display, 6 Month Trial (Reg, Required), For Details Visit DriveUconnect.com, SIRIUSXM Satellite Radio No satellite coverage in Hawaii or Alaska. 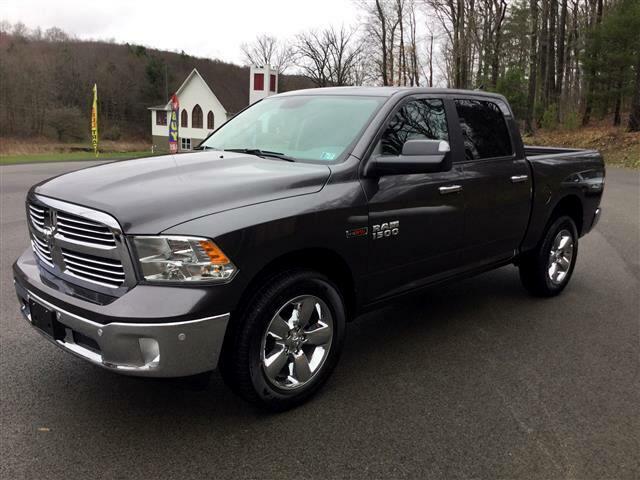 *Drive Your Ram 1500 Big Horn With Confidence *Wilson Auto Sales, LLC graded the Overall Condition of this vehicle as Excellent. Clean, non-smoker interior! *Visit Us Today *You've earned this- stop by Wilson Auto Sales, LLC located at 5369 National Pike, Confluence, PA 15424 to make this car yours today!